"I would be relieved to see my brother-in-law in a steady job." As the second installment in the Hulot series, Mon Oncle is a much different, and in my opinion far more advanced piece of filmmaking. Where Tati takes us on a nostalgic look at the past in M. Hulot's Holiday, here he contrasts the ultramodern, mechanized world of tomorrow with M. Hulot's simpler, old-world existence. This is evident right from the opening credits, which appear on an architect's placard, set against a noisy construction site where the future is being built. This image (which Terry Jones, in his introduction, notes Coppolla borrowed for Apocalypse Now) cuts to a brick façade with the title etched in chalk in a very old-fashioned neighborhood: stray dogs roaming the streets for scraps of garbage, and a decidedly earthy look. The humor here lies in the characters' relationship to their environments—or lack thereof. We are soon introduced to Hulot's sister's family, the Arpels. Living behind an iron gate in a futuristic dream home, she keeps the place fastidiously clean and orderly. The yard is sectioned into multicolored rock beds and lawns, with concrete step stones and a winding pathway to the front gate, which passes by an ungodly fountain meant to impress visitors. The inside is sparse, yet decidedly functional; the kitchen is brimming with modern gadgetry. M. Hulot, on the other hand, lives in the old part of town, where horse-drawn carriages can still be found, and we see his arrival home as he makes his way up the stairways, glimpsed through the many windows and openings in the multistory apartment building where he lives. Like his sister, he has a sense of order, as evidenced by his replacing a brick from the crumbling ruins of a wall; yet, depite his attempts to conform, Hulot does not fit into the new world order. He is pegged for a job at his brother-in-law's plastics factory by M. Arpel, who feels Hulot needs a respectable position to fit with their social status, and partly to overcome his jealousy over Hulot's childish rapport with Arpel's son. Hulot obliges, but a mishap while going to the interview causes a fatal misunderstanding, one of many throughout the film. To me, the plot here is far less important than the exposé on the characters that populate it: the uptight, increasingly modern and materialistic sister's family and social circle, and the bumbling, yet honest Hulot, who delights in more simple pleasures, like the singing of his neighbor's bird, or spending time playing with his nephew, or conversing with the locals on the street. Tati's powers of observation are brilliant: the street sweeper who never sweeps, the appearances of social status evidenced in Hulot's sister's ultramodern, yet sterile house full of gadgetry, and of course the fish fountain that only gets used when trying to impress important guests. As is the case with M. Hulot's Holiday, dialogue is, again, not really key to the exposition; it serves more as a soundtrack to the film. The visuals are what carry the picture, and they do so marvelously, though the scripting is, without doubt, seeped in detail for the many sight gags that frequent the work. Before I had seen any of Tati's work, I had seen references to earlier comedians like Keaton or Chaplin, though, from my albeit limited exposure to both, the connection is not that clear, since, other than that all three are brilliant at what they do, to me, these older artists excel more at playing the buffoon, a style I often find overdone, and not all that funny. Tati, on the other hand, reminds me more of the later Peter Sellers (probably due to Tati's influence), especially his Clouseau roles, where he constantly, yet unwittingly causes havoc, with a much more innocent and natural, though clumsy, style. I find this more understated (though ocassionally over-the-top) performance much more appealing, personally. I also love the use of color throughout this film, as those "modern" steel grey and blue 1950s palettes are wonderfully captured, juxtaposed against the browns and greens of vacant lots and decaying leftovers from pre-war society. As we see throughout Mon Oncle, the old is being removed for the sake of the new. Tati's take on this modernized world leaves one with the impression that he hasn't much favor for it, as its inhabitants are more often than not restrained by their technology. Unlike Hulot's carefree strolling through the old neighborhoods, idly gossiping with the inhabitants, his sister has to put on a show for her neighbors, with some hilarious consequences. 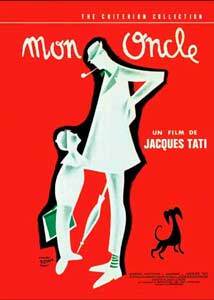 Mon Oncle should not be missed. Image Transfer Review: I think most will find the image presented here to be extremely gratifying. The opening does suffer from a bit of uneven exposure across the frame, resulting in a bit of pulsing, but the remainder doesn't seem affected like this. Print flaws are minimal, and the color reproduction is stunning—the pastels of the "modern" era as well as the rich and earthy old world tones. Check out the contrast on that salmon, lavender and bright green Belair in the final part of the film. Grain is well presented, and detail is good overall, though a few sequences lack in sharpness. I could recommend this film for its color palette alone. Audio Transfer Review: The original French sountrack is well preserved, though it does seem to have some gating applied to it to eliminate hiss. There is no distortion present, and dialogue is clear. Frequency range is limited, though only lacking in the extremes, which do not detract from the presentation. Good work. Extras Review: Like M. Hulot's Holiday, Criterion has included a video introduction to the film by Terry Jones, who points out several interesting facts about the film while giving his enthusiastic impression of it. Once again this segment does contain excerpts from the film, so I would recommend saving this until after you've viewed it for the first time. Unlike the first Hulot disc, none of the extras are time coded on this disc. Criterion has also included one of Jacques Tati's early directorial and starring efforts, the approximately 18-minute L'école des facteurs (1947). This is more in line with the slapstick references mentioned, as Tati plays a young man fresh from Postal school, out delivering his mail. The source isn't pristine, but the rendition covers the full scale of greys evenly. I'm very happy to have this included, and hope future discs will also have these shorts presented as more examples of Tati's work. An essay on the film is included in the enclosed leaflet. Criterion's standard color bars are also on the disc. With Criterion's release of 1959's Oscar® winner for Best Foreign Film, I have discovered another gem in Mon Onclethat I otherwise would have missed. Tati's brilliant and hilarious photoplay captures the essence of a world on the brink of renewal, yet exposes the idea of a perfect future for the façade it often represents. There is so much I could say about this film, but would still not do it justice. Its images keep replaying through my mind, with all the facinating and detailed humor that saturates this wonderful work. The presentation, though not completely perfect, still looks beautiful, and serves as a fitting repository for another great addition to the Criterion Collection. Highly recommended.